In a given day a physician will help patients who are experiencing the hardest times in their lives. Providing comfort to these patients needs to be at the forefront of their minds, not worrying about entering residency data. Simplify your processes and seamlessly integrate your needs into a single solution. 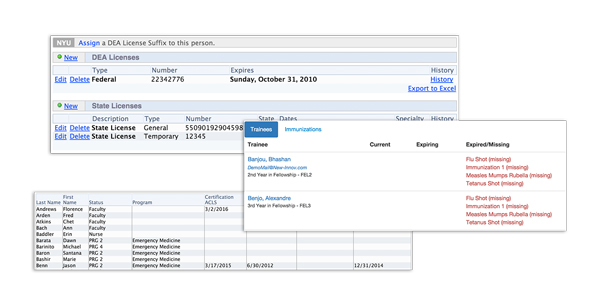 Using the Residency Management Suite, your institution can handle scheduling, case logging, evaluations, monitor conference attendance, and much more. “...NI has helped us to improve our process workflow and has increased our efficiency. We look forward to continuing the collaborative tone working with the staff of NI as we grow/prepare the challenges of the ACGME Next Accreditation System (NAS)." The New Innovations software assists you to intuitively monitor institutional performance including expiring licenses, certifications, CLER Visits, required personnel data, and institutional agreements. Efficiently identify problem areas within your institution to ensure compliance. APE, NAS, and CLER Visit features help you collect accreditation data through resident polling, site specific policy records, and key personnel reports. 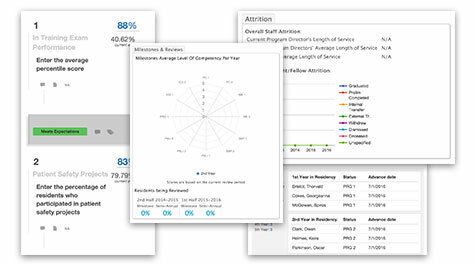 At a glance, you can review program performance to see where programs struggle and where they excel. You can also view program trends, focus in on key areas, and visualize which programs had a critical response to a question. Take charge of your institutional reimbursement issues with our Finance applications, which efficiently manage over $6.2 billion in Medicare/CMS reimbursement every year. 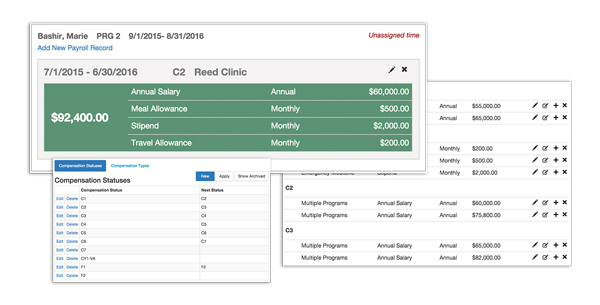 Automate billing for trainee costs with tools designed to support finance personnel. 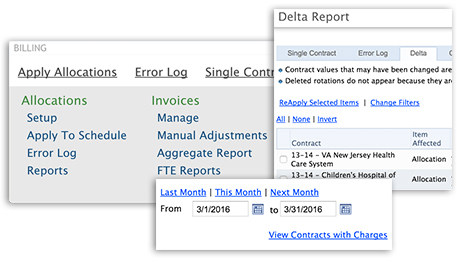 Enable your institution to configure custom "Contracts" that define the contractual obligations between itself and its affiliates. Allow GME and finance personnel to collect and export IRIS information for Medicare Cost Reports. Within New Innovations you can calculate weighted GME and IME figures, import legacy IRIS information, and export database functionality. to help you consistently drive improved results. 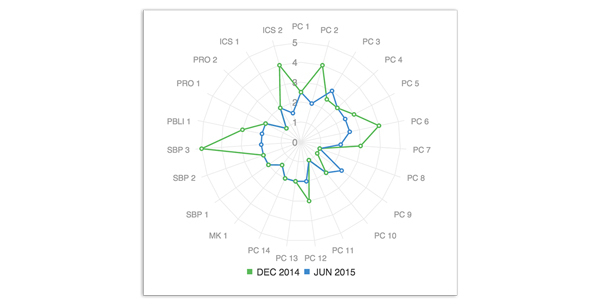 Compile timely and relevant data about the performance of your personnel and their rotation experience. 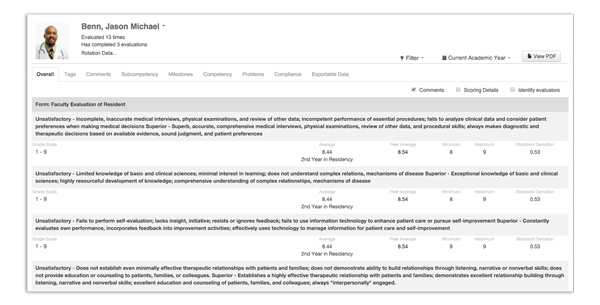 A complete 360° evaluation process can be achieved by setting up rules to automatically generate evaluations for all trainees, faculty, and ancillary staff. Efficiently accommodate requirements of the Next Accreditation System with our CCC Milestone Review. An intelligent display of average scores for all trainees allows the CCC team to easily track program progress over time. 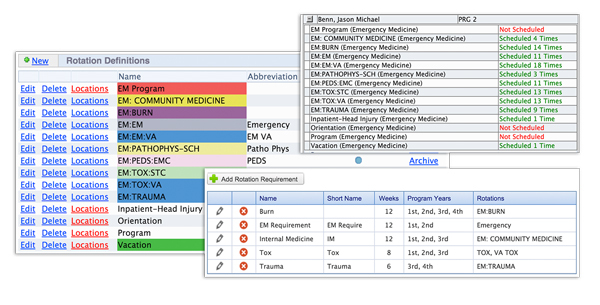 Track information about procedures performed and diagnoses made by trainees in your program. Accurately monitor required levels of supervision for performing procedures and set target numbers for trainees to meet. Trainees and faculty can now easily follow WebADS reporting format by logging scholarly activities using forms that you create. 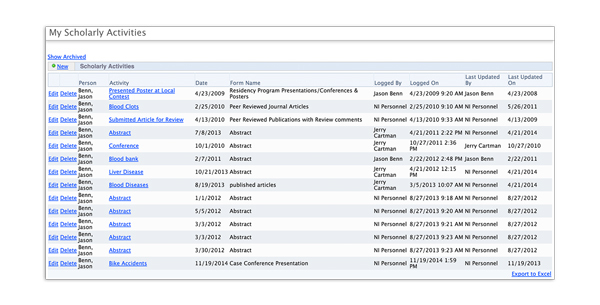 They can also conveniently access PubMed from our suite with an article search and linkage tool. 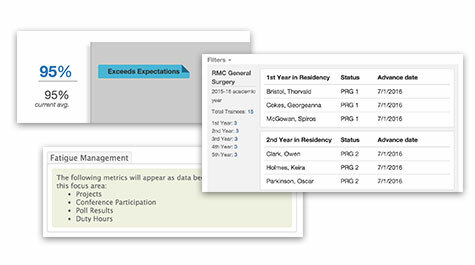 Create and maintain resident portfolios for semi-annual reviews by gathering a resident’s cumulative statistics. Configure data you would like included from the Duty Hours Summary, Evaluation Comments, Milestone Scores, and much more. patient history, and much more. Track trainee hours worked and easily visualize violation details. 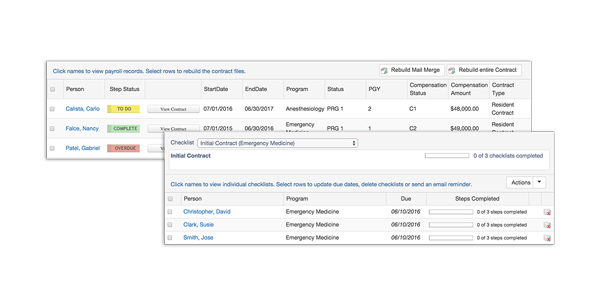 Configure rules according to your program, reduce redundant data entry by importing the daily schedule, and include sign-off options that require trainees to verify a complete log. 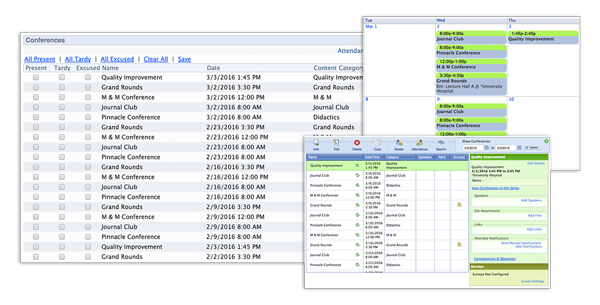 Allow administrators to seamlessly manage conferences. Rid yourself of conference pains by adding shared files for attendees, intelligently assigning speakers, uploading speaker material, sending email reminders, and distributing conference surveys. Attach required materials to rotations and assign them to trainees and faculty for review. Streamline your process by sending and tracking email reminders asking trainees to view their curriculum a specific number of days prior to the start of each rotation. 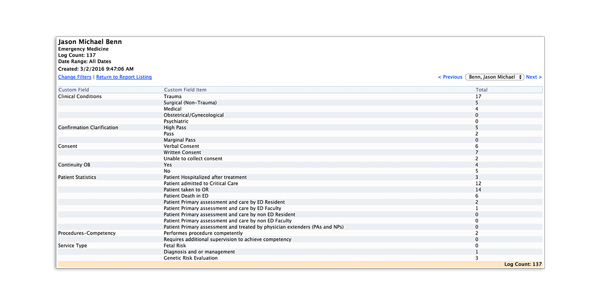 Track patient history, visits, and diagnoses by a trainee. 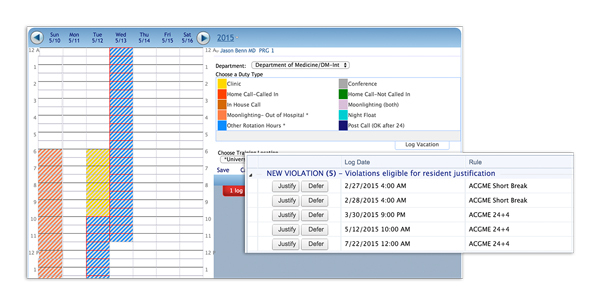 Format your data into a number of reports that can tie directly to procedures logged during a patient visit. 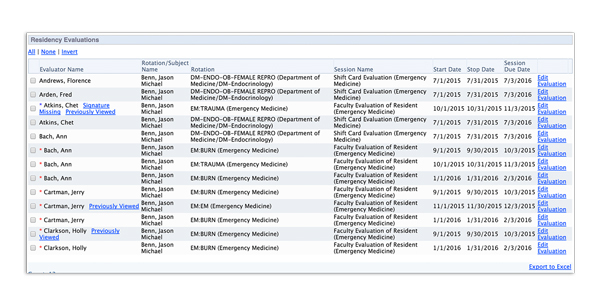 Patients can be easily shared between trainees and departments. Whether maintaining rotation schedules, call schedules, staffing a clinic, or coordinating ER shifts, our suite provides efficient entry and distribution of all schedule information. Manage yearly academic schedules and share them with everyone in your program. 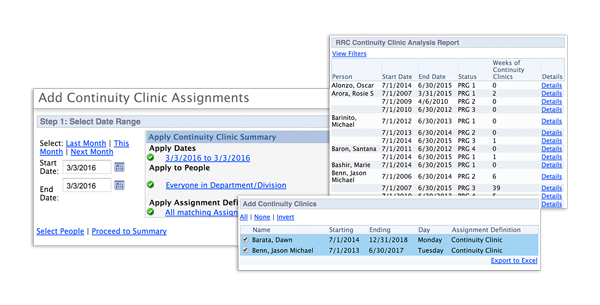 Create an unlimited number of schedule views to include rotators, rotation names, trainee years, and faculty, with easy print options once you’re finished. 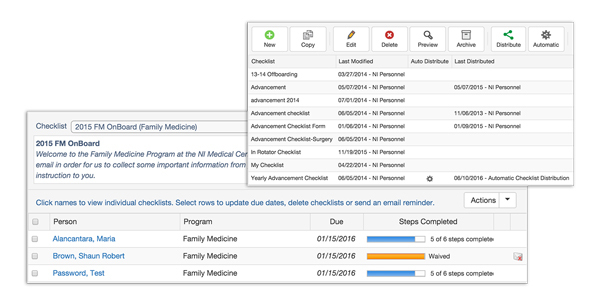 MedScheduler gives you the freedom to set up program schedules anywhere and then synchronize the data when you have internet access. 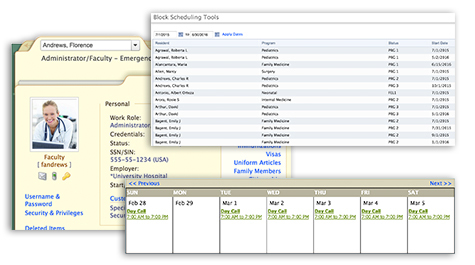 Configure scheduling guidelines and set up schedules quickly using our convenient drag and drop functionality. 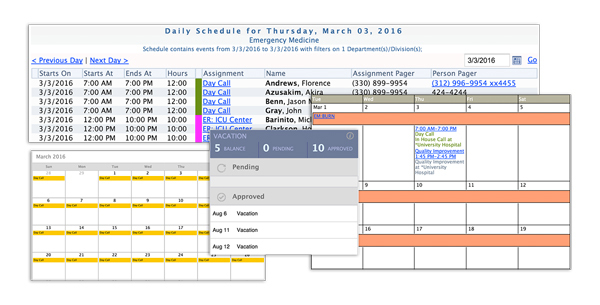 Efficiently handle short-term scheduling. Manage requests for days off or for specific assignments and automatically feed projected assignments onto your trainees duty hour logs for their approval. 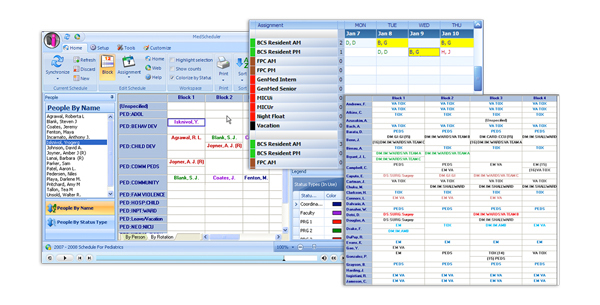 Schedule information and logs can then be used to inform IRIS. Ensure efficient organization of medical staff affairs, personnel information and files, contract administration, onboarding, and physician credentialing retention. 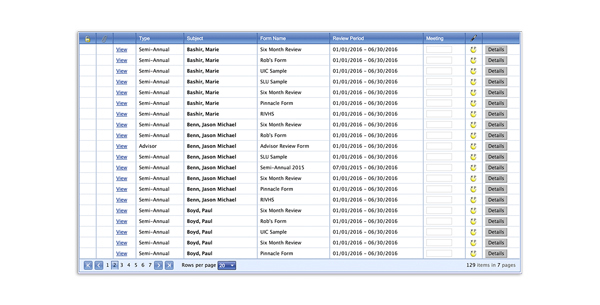 Efficiently keep track of payroll amounts and funding sources. Remain current with all payroll initiatives and keep in line with the finance office. Ensure all certifications, licenses, and other endorsements are up to date. Training letters and immunizations can be stored and updated in a centralized place to ensure compliance with accrediting bodies. Use appointments to take the pain out of managing yearly resident appointments. Seamlessly collect and distribute all contractual information for the duration of an appointment.